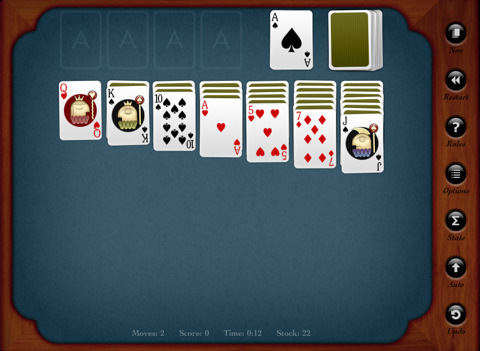 Looking for a simple and effective Solitaire app for your iPad? Smallware has one called Plain Old Solitaire HD which is probably one iPad Solitaire app in the App Store that has zero frills and only good basic graphics and smooth animations. Dubbed by Smallware as the “the easiest solitaire game they’ve made in 12 years” you basically get a traditional set of cards laid out, which you can move with one tap. Plain Old Solitaire HD gives you options to make the game feel more useful and easy on the eyes too. You can enable large print mode to see big easy to read numbers. Showing or hiding stats includes Score, Time, Moves, and Stock Count. You can choose to draw either 1 or 3 cards. As far as graphics you can edit the card color and the table cloth color by dragging a dynamic slider which allows for a large amount of variety, anywhere from pink, to the classic white on green. Other options include viewing your stats, the game rules and easy restart and undo. You can play the game in both portrait or landscape. Besides being no-nonsense game, the other strong point for Plain Old Solitaire HD is the excellent bright, sharp and detailed graphics, making playing Solitaire a joy on your iPad. The only complaint I have about the Plain Old Solitaire HD iPad app is the automatic movement. Tapping on cards moves them to the available legal spots on the board without you having to drag or double tap their destination. Tapping multiple times on the same card rotates the card amongst all available legal positions. It would be nice if this automatic movement was an option that could be disabled, since it cheapens the idea of having to work on your concentration skills. I hope Smallware will add this feature soon. Otherwise this is a great iPad app and definitely worth considering for all Solitaire fans. If you’re looking for something with a little bit more features, be sure to also check out Real Solitaire for iPad from edge rift. AppSafari review of Plain Old Solitaire HD was written by Joe Seifi on July 18th, 2010 and categorized under App Store, Board, Fun, Games, iPad apps, Puzzler. Page viewed 4595 times, 1 so far today. Need help on using these apps? Please read the Help Page.